You’ll learn how to set up your Instagram account the right way, so that you can position your business for massive success and avoid costly mistakes that can sabotage your efforts! You’ll learn how subtle elements in your Instagram profile can have a dramatic impact on your success… and how to optimize your profile to skyrocket engagement! You’ll learn why linking to your website homepage is a bad move… and exactly what you should link to instead! You’ll discover the easy way to track link clicks… so that you know exactly how well your Instagram campaigns are performing! You’ll find out how often you should post – and what types of content to post – for optimal results! You’ll learn exactly which times of the day to post for maximum engagement! 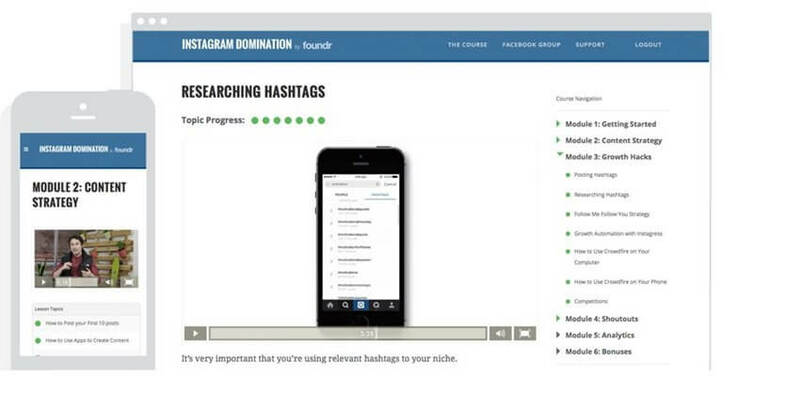 You’ll develop a “stealth strategy” for interacting with your Instagram community and responding to comments! You’ll find out why hashtags are critical to your success… and how to choose hashtags for maximum exposure with minimal effort! You’ll learn how to use all the Instagram Tools, so you can create super professional and HOT looking images to make your content go VIRAL, and make attracting enthusiastic customers even faster and easier! You’ll get little-known geo-targeting strategies for building your follower list almost effortlessly! You’ll learn multiple Shoutout strategies for dramatically increasing visibility and engagement! You’ll find out which tracking and analytics tools give you the most relevant information about your Instagram campaigns with the least amount of effort! You’ll get proven strategies for outsourcing almost every aspect of your Instagram campaigns, so that you can spend more time running your business and taking care of your customers!